The original overview blog post is here. I met Art Graham a number of years ago when he was giving demonstrations (and free samples of his paint!) at the University of Oregon Bookstore’s annual Art Tools of the Trade show. He was very generous in not only his samples, but also in sharing knowledge. At the time I was getting ready to work on an oil paint based stop frame animation. One problem I kept running into was that my paint would keep drying on me before I was done with a scene. I switched to M. Graham paints for the piece which helped (walnut oil dries slower than linseed oil), but the one suggestion he gave me that really did the trick was to add a couple of drops of clove oil to the mix. This slowed down the drying time to about three or four weeks before I got a skin on the paint. My locker smelled like clove oil for the rest of the year! So, when I was getting ready to start the From Scratch project, he sprung to mind as someone who could help. We visited M. Graham paints on Wednesday, April 11. Before I visit any place for the first time, I inevitably imagine what it will look like and how the experience will play out. These expectations are never same with the reality. Not better or worse, just different. I expected a larger building, as I had no idea how much space the mixing, milling, and filling machines would take up. It was a cozier and friendlier than I expected. One thing that did match my imagination was the passion for quality that was evident in every step of the process. There was also a sense of pride and idealism. This company is being run by someone who simply will not compromise quality for profit. One reason Art started his own company was when he worked at a previous artist’s color company, he began to question why there were formula changes throughout the years. He found out it always came down to money over quality. I also had no idea how much of the process was done by M. Graham paints, and how much was left in the hands of vendors. What I learned was that instead of doing absolutely everything (like my project), Art is more like a master chef. He carefully chooses the finest ingredients, and mixes them according to his carefully guarded recipes for maximum quality in his paints. His art lies in coming up with the best mixture. So, his company doesn’t create the pigment, but has found companies who provide the best pigments available. He doesn’t grow the walnuts that go into his walnut oil, but he has found a supplier who has a consistency that is perfect for his paints. He doesn’t smelt and roll the metal that becomes his tubes of paint… you get the idea. He concentrates on the act of creation. Coming up with the perfect mix is quite a process. First of all, there’s qualifying a vendor. For him, qualifying a vendor is a major undertaking, and once one is secured, he sticks with them for a very, very long time. He looks for quality, consistency and reliability from a vendor. 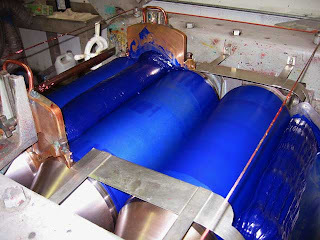 If a pigment is not consistent, then it requires tweaking each batch of paint to get a good result, which takes more time and can throw off production and delivery times for his product. Disappointing the stores that sell his paint is something he doesn’t want to do. Although he could save money with cheaper pigments from China or India, he feels that the quality and consistency just isn’t there. In fact, some pigments such as alizarin crimson cost him ten times the amount he could get elsewhere, but he feels that it is worth it to get the best. One of the main differences between M. Graham & their competitors is the pigment load in their paint. “If I can find a way to put another 5 pounds of cadmium into a batch of paint, I’ll do it” says Art. Their oil and acrylic paint consist of only the pigment and the medium. That’s it. No fillers or other agents to save on costs. 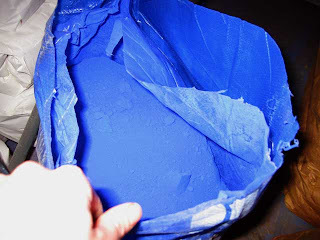 The pigment and medium are weighed (accurate to 1/100th a pound), mixed, and milled. After milling, the paint is mixed again, which makes it more workable for the artist. Finally, the tubes or jars are filled, aged, boxed up and shipped. Every pigment has its own color, tint strength, particle size, weight per gallon, and absorption of medium. The goal is to create a dispersion. That is, to surround every atomized granule of pigment with the medium, with no clumps. In the case of his oils, that medium is walnut oil. There are a number of ways to do this, but M. Graham paints uses a three roll mill, which through its shearing action, pulls apart the pigment clumps. Simply crushing the mixture will not work. Such action can change the properties and color of a paint. For example, crushing cobalt shatters its crystals, turning it from a brilliant blue to a dull gray. There are three things to consider when coming up with a recipe for milling a color. Every color has its own pressure, number of mill passes and speed. It’s a trial and error process, a craft. Minor modifications will make a huge difference. Although they are fully compatible with other acrylics, M. Graham acrylics feel different. I’m not sure I can describe this very well, but whereas other brands feel like you’re painting with plastic, his paint feels unique. The only way I can describe is “feeling the pigment as you paint”. It would also seem that the color has more depth than other paints. Finally, the type of acrylic medium he uses in his paint dries a lot harder and binds a lot better than other acrylics I’ve used. Although I don’t currently work in gouache, my friends who belong to the SCA do (you know, people who dress up in medieval garb and hold festivals). They absolutely love M. Graham’s gouache, not only because it’s the closest thing you can get to “period paint” (historically accurate ingredients) but also because it works so well. There are two unique things to note about this paint compared to other types of gouache. First of all, one of the ingredients is honey, which makes for smooth application. Second, unlike most gouaches that have fillers to make every color opaque, Art makes his paint opaque simply by loading it heavily with pigment. For some colors, this means that they are still transparent, but this gives the artist more options. If they desire opacity, the artist can mix paints to create this effect. His oil paints are walnut oil based, and are compatible with linseed oil paints. This is the same type of oil the masters used, and does not yellow like linseed oil. (Linseed oil is a byproduct of the linen industry, so its use in artist paint is a little more modern). Walnut oil dries slower than linseed, which gives the artist more time to work the painting. If a faster dry time is desired, M Graham also provides a walnut alkyd medium. One added benefit of using walnut oil over linseed, is that brushes can be cleaned in walnut oil and soap rather than nasty solvents. This is better for the health of the artist, and better for the environment. I’d like to say that the only reason I visited M. Graham paints was to get leads on how to make my own paint from scratch. While Art was very helpful with tips on paint making, suggesting on books to read and things to try, that was just a paper thin excuse to visit him and the place that makes the paint I love so much. There are a scarce few people in this world who are truly passionate about what they do. Of those, even fewer are as idealistic, helpful and welcoming as Art Graham. If you’re an artist, he’s just fun and inspiring to be around. His paint is in the ever-shrinking class of products that are truly great, products that are the honest quality you expect. Martin Guitars, Craftsman wrenches (guaranteed forever, not just your lifetime), Flexcut carving tools. If you paint, you really should give them a try. As it says on the entranceway, “Every artist deserves the finest color that can be created”. Thanks for sharing your experience with the M.Graham trip. I love the oil paints and found some of the extra information about the whole process that goes into making them very interesting. Some of the little details, like how the cadmium's are made safer than other brands was good to know. I normally use indian yellow for my warm yellow, and cad lite for my cool and recently gave in and added orange and worry. Thanks for taking the time to read it! I'm glad you like his paints. If you ever had the chance to meet him, I'm sure you understand why he is such an incredible person. One other thing he mentioned about his cadmium paint that I may have neglected to put in the article: I believe he said that his cad comes from recycled batteries. I could be wrong about this, so if you're reading this Art, feel free to correct me!